Once upon a time, a shower of shiny gold coins fell from the sky over Palo Duro Canyon State Park south of Amarillo. Even so, the metallic manna-from-heaven-style event drew a big crowd to the rim of the canyon and may have netted two lucky people all-expense-paid, eight-day vacations to Havana, Cuba. That was back during the long dictatorship of President Fulgencio Batista when Havana was a wide-open party town controlled by the American mafia. On May 28, 1949, an airplane flew over the nation’s second-largest canyon and dropped 10,000 coins over the park, which then covered some 16,000 acres and now includes nearly 30,000 acres. A thousand of the coins would be redeemable for prizes collectively valued at $10,000. Once the coins had been dropped, Gov. Beauford H. Jester cut a ribbon at the entrance to the canyon to trigger a 20th century “gold” rush and the earliest large-scale effort to position the canyon as a major Panhandle tourist destination. Park officials were bracing for a turnout of 100,000 people that day, but whether that large a crowd actually showed up was not reported. No matter the number, the driver of each car entering the park had to pay 42 cents, plus 24 cents for any additional adult in the vehicle. Children got in for 12 cents. As soon as the visitors could drive down to the floor of the canyon and get their cars parked, the treasure hunt began. 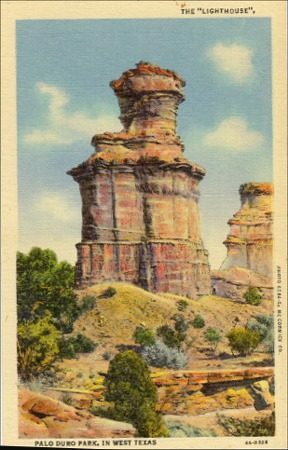 What they hoped to find was a coin that on one side bore the legend “Texas Palo Duro Canyon Treasure Hunt 1949.” The other side featured a raised image of the park’s most famous landmark, the towering rock formation called the Lighthouse. A number had been stamped across the lower part of the Lighthouse near the bottom of the coin. All the coins with numbers ending in seven netted the finder a prize if claimed by Labor Day 1949. Other than the grand prizes, finders had a shot at season passes to Amarillo Gold Sox home games; a $250 diamond ring donated by an Amarillo jeweler; and two registered quarter horses from Panhandle rancher Glenn L. Casey. 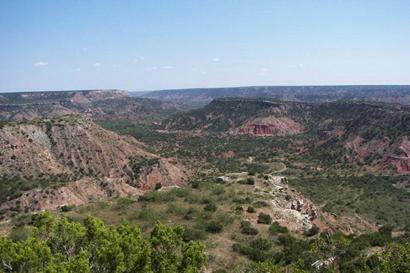 An organization called the Palo Duro Canyon Boosters Club sponsored the effort. Contemporary newspaper coverage in advance of and after the event doesn’t reveal whose brainchild this campaign had been, but whoever dreamed it up hit a public relations homerun. It might have been F.W. “Fist” Ansley (1899-1979), chairman of the club. Since Braniff Airways had put up the top prizes, that pioneer aviation company doubtless played a role in the publicity campaign. In fact, some PR type at the company’s Dallas headquarters may well have come up with the idea of cashing in on the fact that 1949 marked the centennial of the great California gold rush. The organization hoped to gain as many new members as the number of coins dropped from above, each membership costing $1. Whether that happened was not reported, but given that people are generally more interested in getting something for nothing than spending a dollar when that much money could buy nearly a quarter-tank of gasoline, it’s hard to believe the boosters reached their hoped-for number. Six decades later, park visitors still occasionally find one of the coins from the Palo Duro Gold Rush of 1949. Unfortunately, though nice collectibles, they no longer are redeemable for prizes.